Henry VIII built Mawes Castle between 1539 and 1545 on the eastern shore of the River Fal estuary. The castle was constructed with a large central tower flanked by three circular bastions giving gun placements to cover all angles of approach. 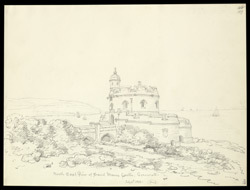 Mawes was one of several castles built by Henry in his strategy to protect the southern coastline from potential invasion from French or Spanish fleets. During his reign however, this castle saw no action. Elizabeth I, anticipating a full-scale Spanish invasion after raids further along the coast in 1595, strengthened the castle's defences. Again, no invasion materialised and it was only in the Civil War during the 1640s that the castle became engaged in military activity. The Royalist captain surrendered St Mawes to Parliamentarian troops shortly after being confronted.